We all have a sense of acclaim for risk takers in life.”Greater the risk, greater the reward.” Haven’t we heard that saying all our lives? But sometimes risks are taken when they carry no rewards even at the cost of life. They are still taken because they are necessary. 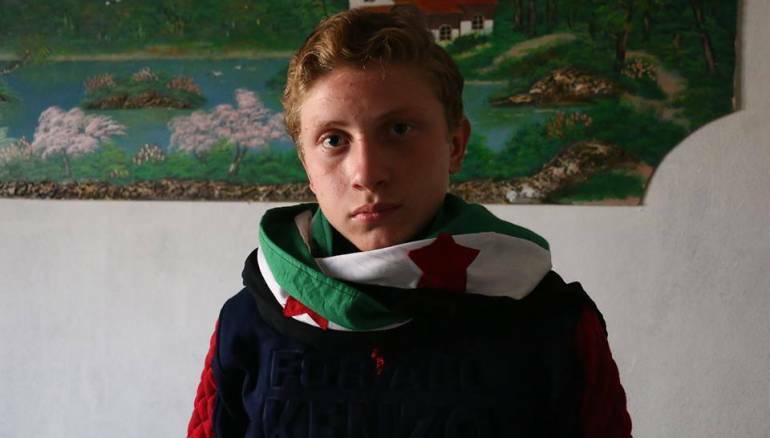 Eastern Ghouta is home to 15-year-old Muhammed Najim. In a land where 153 journalists have been killed since the Arab uprising, a 15-year-old boy yearns for the world to know what is happening in Syria. Although the government has defended itself numerous times labeling the war as a fight against the “Terrorists”, a picture cannot lie. Watch Muhammed report amidst air strikes. That’s where Journalism finds its meaning. It is an unquenchable thirst to document the truth, no matter the consequences. Media is a powerful weapon that can influence ideas and opinions in a heartbeat. It has the power to overthrow governments and instill a revolution. Through the years of its existence, Syrians have been denied the freedom of speech, and any opposition to the government is a punishable offence. Under the Assad’s regime, the country has encountered a new era of mass suppression. According to Reporters Without Borders, since January 1 2013, citizens who post comments and blogs online have been imprisoned by the controlling regime for posts or comments critical of the Assad government or the Baath party. The Government has blocked access to websites like Facebook, YouTube and Twitter, making it impossible for the citizens to reach out to the world. According to the BBC, on 29 November 2012, Syria’s entire internet connectivity was shut down virtually isolating the country from the rest of the world. Rebel groups stated that similar internet blackouts have occurred prior to major military operations in the areas to prevent Syrians from organising protests and posting videos of civil rights violations committed by the Syrian military. International journalists who have traveled to Syria have been imprisoned, tortured and killed. 70 journalists remain trapped while 153 have been killed since the beginning of the war. In a country named as worst place for Journalists, Journalism has been emerging and infiltrating the battle lines to report the truth. Since international journalists have no access to the area, citizens of Syria who have had no formal training in journalism have taken up their cameras and gone out reporting civilian and refugee crisis, and revealing the true nature of the regime. Before the start of the conflict, Akoush was studying dentistry at Aleppo University. “It was my childhood dream to become a dentist, but after just one semester I was forced to stop going to university, due to the ongoing war,” he says. He began volunteering in local medical facilities. It was there, witnessing the horrors of war, that the idea of a different career path solidified in his mind. “I became interested in journalism due to the absence of objectivity and professionalism in Syria’s media outlets,” he says. “After the rocket attack near my home, which had been only superficially reported, I knew that documenting the truth was what I wanted to do with my life.” – Source: Columbia Journalism Review. Syrians have changed the meaning of risk-taking for us. They bear the burden to document the story of Syria as seen by the people through these times of serious jeopardy. When a 15-year-old boy goes out to report the landscape of his war-torn country, how can it not call out to the world to act? Since the destruction of educational institutions, many aspirations have faded away in the sound of war. Syrians, have however diverted their minds to things they can do, rather than the things they can’t. Wait till the next post to know how these efforts have lead to a significant change in Syria! Technology: The challenge to bridle. What does Bashar Al Assad think of the Syrian crisis? Good write up. We need many more unbiased eye-opener articles such as these. These proxy wars are never going to get over until the region’s resources get dried up. The world powers are just milking these territories in their long term plan to meet their 22nd century resource needs, similar to what Britons and Spaniards of 20th century did. Everything is a well planned and executed stage drama (just shown to the world as coincidences or consequential events).